“Smart shrinkage” is a phrase referring to the downsizing of a city while simultaneously advancing it. Smart shrinkage is the premise behind the SMART2 Network — a project started by Eastgate Regional Council of Governments looking to perform makeovers on many of the streets from downtown Youngstown to the North Side were Mercy Health is located. Some of the changes to Downtown would include adding landscaped medians, bus-drop off lanes, narrower traffic lanes, biking lanes and stations along with a few other beautification details. 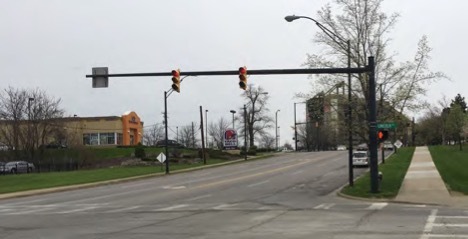 The basic goal of SMART2 is to make Downtown and some of its surrounding businesses feel more connected, making it feel like less of a travel from the Youngstown Business Incubator on West Federal Street to Mercy Health on Park Avenue, for example. Executive Director of Eastgate, Jim Kinnick, said the project has been around for a couple years and has been proposed two times prior but was unsuccessful in receiving the needed funding to bring SMART2 to life. To make it a reality on its third attempt, Eastgate is relying on the U.S. Department of Transportation’s Better Utilizing Investments to Leverage Development, or BUILD, grant. Current street setup of Fifth Avenue. Eastgate has requested $10.8 million from BUILD toward SMART2, which is expected to cost $26.2 million. The rest of the funding will be supplied by Eastgate, the City of Youngstown, Youngstown State University, WRTA, Mercy Health and others through donations and in-kind contributions. If the 10.8 million is not granted, Kinnick said changes will still be made; they just won’t be as drastic and will take a bit longer to develop. 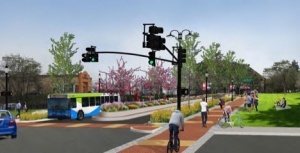 Kinnick said without the grant, there will definitely still be improvements made to Fifth Avenue — minus the autonomous transit shuttles. Of all the streets affected by SMART2, Kinnick believes Fifth Avenue will have the most improvements made to it. This would include two self-driving shuttles traveling up and down the street. Associate Professor of Computer Science & Information Systems at YSU, Abdu Arslanyilmaz, said having autonomous transportation on Fifth Avenue would benefit residents of this region. “It will reduce the number of accidents by eliminating driver errors and distractions as well as improving the level of decision-making and reaction time before a dangerous situation,” Arslanyilmaz said. He described some of the characteristics that make a vehicle self-driving. One of which was the technology in the vehicle having the ability to sense surroundings such as other vehicles, people, traffic signs and signals, lane lines and curbs among other things. Proposed setup of Fifth Avenue. “Based on this, the artificial intelligence built into these vehicles is able to make important decisions such as when to start slowing down to stop safely, which turns to take for an optimal path to a destination and how fast to travel based on the road and weather conditions.” Arslanyilmaz said. He said these autonomous vehicles are created to improve safety but that doesn’t mean they’re perfect. Michael Hripko, the associate vice president of research at YSU, has helped collect data for SMART2. He said the BUILD grant requires an aspect of the project to include innovative technologies such as autonomous travel. Hripko said the grant is highly competitive but he feels the commitment to the third attempt may be what sets it apart from the competitors. “We’re confident that we’ll meet the metrics that they have prescribed,” he said.